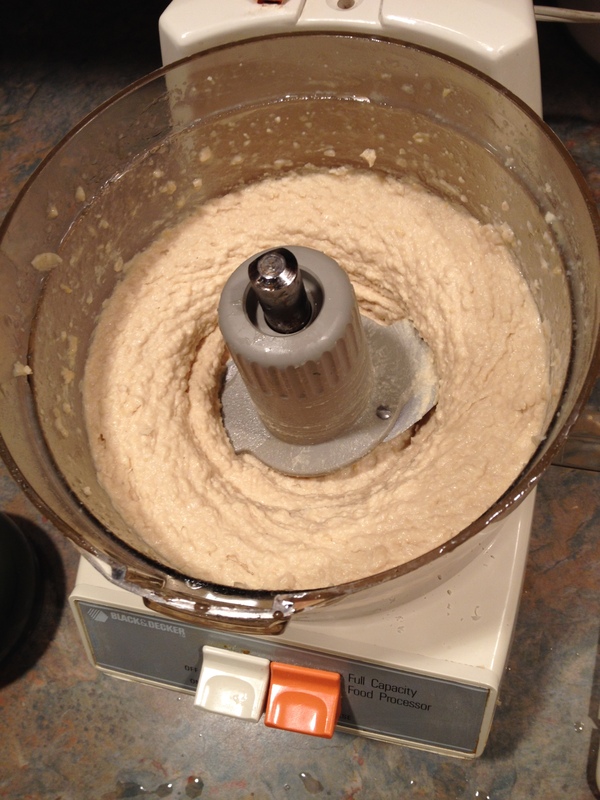 The first time i made hummus two thoughts popped into my head. one- – you have got to be kidding me… this easy??!! there has to be something else, some complicated step…. 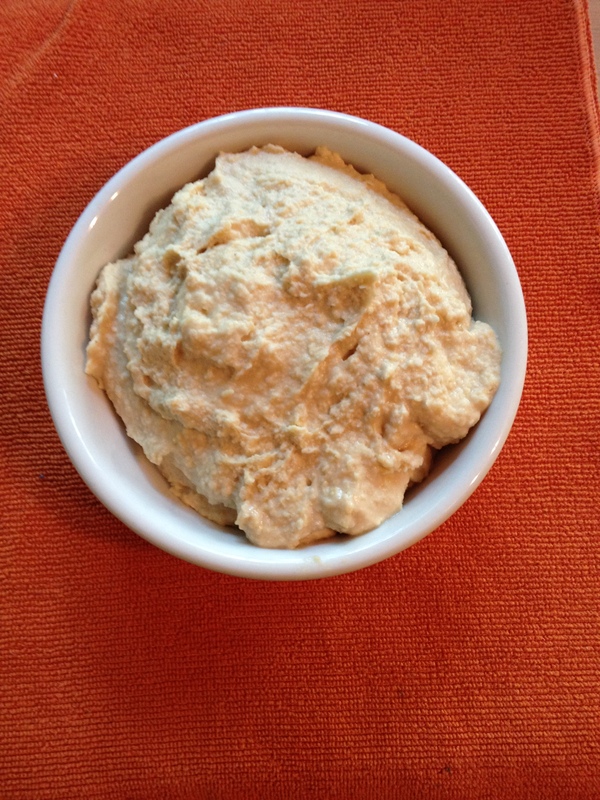 and two- – i will never ever pay 4$ for a small container of hummus again!! 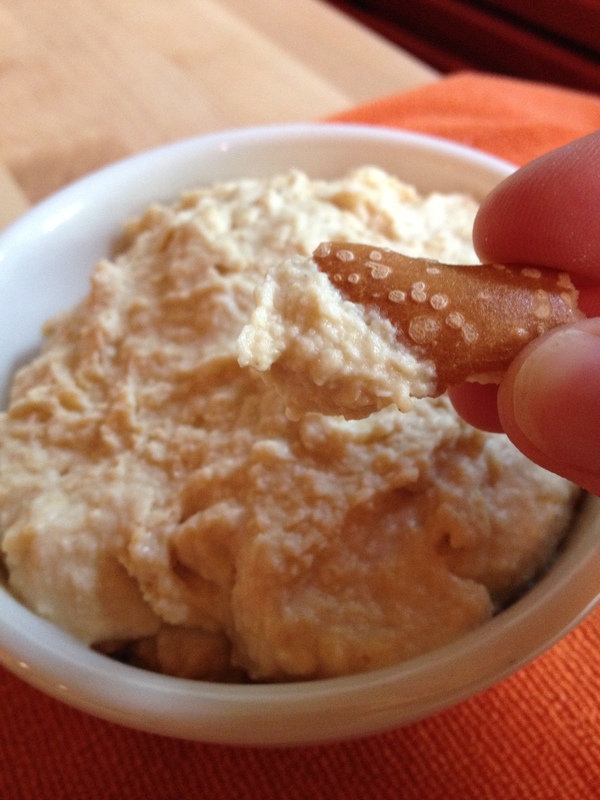 Hummus is one of the most versatile dips/ condiments… call it what you will- out there today in my opinion. it can be your first layer when building a veggie sandwich or pita, it can be carried from dish to mouth on pretzels, carrots, zucchini strips, bell peppers, celery… the possibilities are endless. use it instead of mayo on your next chicken sandwich or wrap and you have saved yourself some fat and added some protein! the fat that hummus does contain comes from the olive oil and the tahini (ground sesame seeds) which are the heart- healthy fats you should be getting more of anyway. hummus is a staple in Middle Eastern diets, but it has certainly gone mainstream over the past few years, so much so that it is served weekly in my daughter’s elementary school lunchroom as “ha ha hummus” ! (i love it) the taste is very distinct… even i will admit that- but somehow, it works. it is delicious, and becomes as addictive as those packaged sour cream and chive dips we all grew up noshing to our heart’s content (or discontent, lol) with greasy potato chips at every family gathering. chickpeas are the main ingredients in hummus, also known as garbanzo beans, and they are truly a staple in most vegetarian and vegan diets today. they have no cholesterol, and in studies have actually been shown to prevent the build up of cholesterol in blood vessels. they are high in protein, and have no saturated fat. they are both filling and satisfying at the same time, and can be cooked in with rice or stews or thrown on top of salads – taking the place of meat with ease. enough about chick peas. let’s get down with the hummus. get out your food processor or heavy duty blender (i’ve never made it in the blender, but i’m sure it would work out fine.) 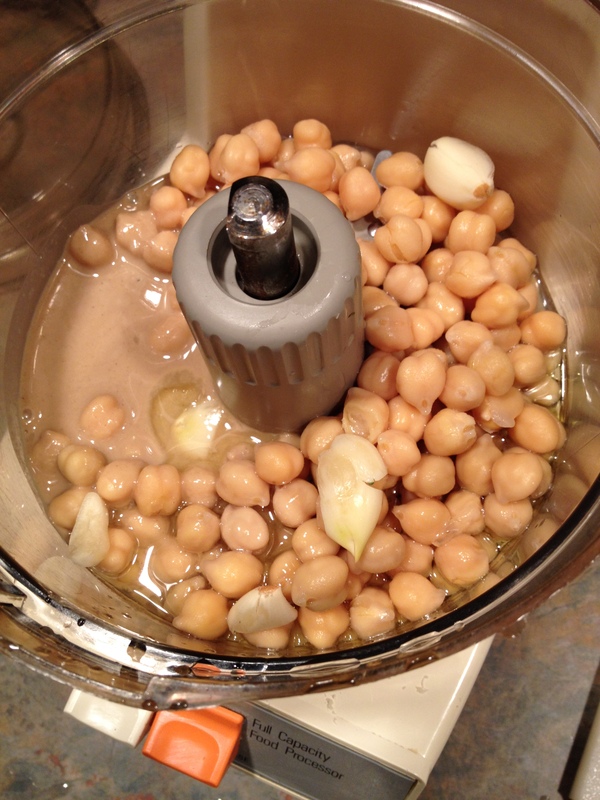 Open and rinse your can of chick peas. Add them to the food processor. 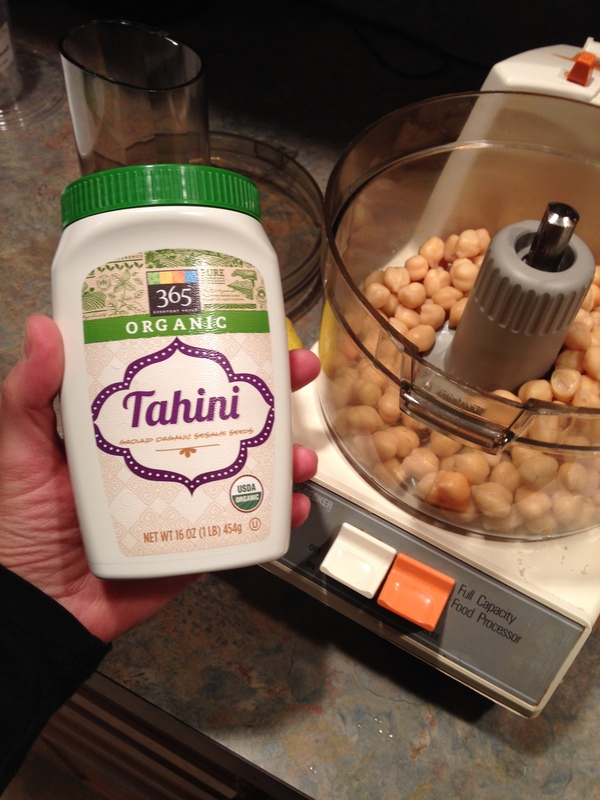 Shake your container of tahini well, and add a 1/4 c atop the chick peas. Squeeze 2-3 Tablespoons of fresh lemon juice into the mix (careful not to add seeds). Peel and crush 2 cloves of garlic and add. Add 2 Tablespoons of olive oil. Add a generous pinch of salt if desired. Attach the lid and fire her up. process until smooth, adding water a Tablespoon at a time if you desire a more thin consistency. turn it out to a serving dish and enjoy!! store in an airtight container in your fridge for up to two weeks, stir well each time before snacking. this is the basic recipe… feel free to add some sundried tomatoes, using the oil from the tomatoes instead of the straight olive oil and adding a tsp of oregano. this would give it an italian flare. go greek with a half cup of feta instead of the tahini- and a cup of baby spinach leaves in place of the garlic. like roasted red pepper?? go there. the possibilities are endless. happy blending yo!! turn it out to a bowl and enjoy!